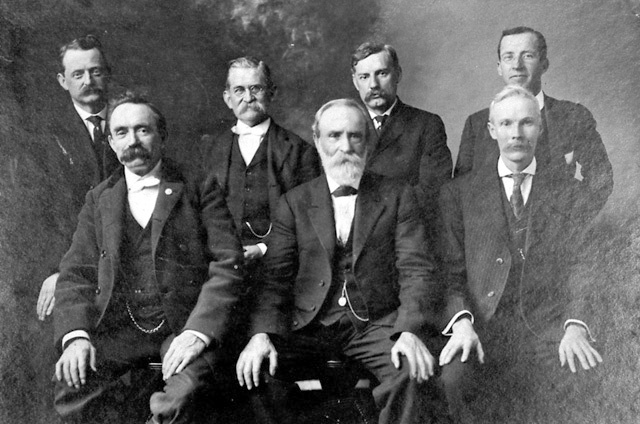 Row Two (L to R): Dr. Joseph P. Blair, Tom Heath, Jackson Beal, Thomas A. Fox. Jacinto V. Pereira was President of Fidelity National Bank on Valley Street and also built the Travelers' Rest Hotel on Main Street. The bank buildings has since been torn down; the hotel burned down in February 1976. Peter Foland operated Scott's Ferry across the James River to Buckingham County until it closed in 1907. At the time this photo was taken, Peter was Mayor of Scottsville. He was born in 1844 and was the son of Frances Jefferson (grandniece of President Thomas Jefferson) and Valentine Foland. Peter married Elizabeth "Bettie" C. Straton, daughter of James Straton and Harriet Woods, and the Folands lived at Mt. Walla in Scottsville. W. E. (Willie) Moon was a merchant who owned the Mercantile Store on Main Street. Dr. Joseph P. Blair was a dentist. His wife's father was, Dr. Pinckney Powers, the Superintendent of Albemarle Co. Schools for thirty years (Dr. Powers lived at the Terrace on Jackson St. in Scottsville). Tom Heath operated Heath Mill, a flour mill on east Valley Street near where the Rt. 20 bridge over the James River is now located. Heath lived in the Old Tavern on Main Street. Jackson Beal was a merchant and insurance agent for Shenandoah Life and New York Fire Company. His office was located in the Beal Building (corner of Valley and Bird Streets). Beal served as Mayor of Scottsville from 1905 to 1930. Thomas A. Fox was the first plumbing contractor in Scottsville and installed the first water and sewer system in town.